← What are the Mathematical and Physical Concepts of “Flat” Euclidean and “Curved” Non-Euclidean Gravitational Fields? This paper postulates a “Dark Matter Force and Pressure” and also gives a conceptual and mathematical description for the reason for choosing a “Vacuum Energy Perfect Fluid” model, and using the Schwarzschild Metric over the Einstein Metric, based on the concept of whether there is “Zero Pressure” impressed upon the surface of the Black Hole Event Horizon; And likewise, whether the “Volume Mass Density” and the curvature of space, space-time, or the gravitational field, surrounding a matter source is normal throughout the gradient of a gravitational field, or whether it is rarefied/condensed through the gradient of a gravitational field, and eventually becomes normal far away from the matter source. In this paper a general introduction into the basic concepts of a “Perfect Fluid” gravitation theory, and this bodes for the necessity of Non-Euclidean “Curved-Space” Geometry, and Spherically Symmetric Metrics, used for describing causality for “Gravitational” interaction of mass with space or “isotropic aether” space-time, and mass interaction with mass. This work is written to physicists that are interested in understanding from a conceptual view, the rationale for selecting “Flat Geometry” Euclidean Space, or selecting a “Curved Geometry” Non-Euclidean Space; as causality for gravity. Likewise this work is written to physicists that are interested in understanding why a Schwarzschild Spherically Symmetric Metric is preferred over the Einstein Spherically Symmetric Metric of space, space-time, or the gravitational field; which is based on a particular choice of “pressure” and “density”. A “Spherically Symmetric Metric” is used for describing the Differential Geometry of Space, Time, & Surfaces, of a “Vacuum Energy Perfect Fluid” model, of spherically symmetric space, space-time, or gravitational field. For example, I present a new idea of “Constituent Forces and Pressures” of Gravitation, and the “Composite Forces and Pressures” of Gravitation. I specifically differentiate between a Newtonian or Self Gravitational Force, and an Isotropic Aether Gravitational Force. In this paper, I introduce a new equations and conceptual rationale for an “Isotropic Rarefaction Force and Pressure of Gravitation”, that is postulated to exist, for any and every gravitational interaction system in the universe. My goal is to bring the concepts of “Gravitation Force and Pressure” and the concept of Non-Euclidean curvature described by the differential geometry of the “Spherically Symmetric Metric” ( ) of space, space-time, or a gravitational field, and due to the presence of mass or matter as the source of a gradient gravitational field, in a localized region of the universe, into correlation. The Schwarzschild and the Einstein “Non-Euclidean” Metrics ( ) describes the gravitational interaction, causality, and geometry of the curvature of space, space-time, and the gravitational field, and is used in conjunction, with a fluid mechanical model, Perfect Fluid “Static or Dynamic” Vacuum Energy Solution for the causality gravitation. The proposed model is the Unified Gravitation Vortex Theory. This Unified Gravitation Vortex Theory describes a closed solution for cosmological and quantum mechanical effects, of matter in motion throughout the universe; and which a few components of the model will be described below. A fluid mechanical, perfect fluid “vacuum energy” solution to gravitation, makes that claims that the “Single Newtonian Gravity Force – Only” solution to gravitation is abandoned; in favor of a gravitation theory, that describes “constituent” and “composite”: “forces”, “pressures” and “energies”; into a more unified theory of gravitation. In this perfect fluid “vacuum energy” model there are constituent Gravitational Forces and Pressures: There is the Inertial Mass “Self” Gravitational Attraction Force & Pressure ( ), and there is the Isotropic Aether Gravitational Attraction Force & Pressure ( ). The physics of the composite Gravitational Force and Pressure is responsible for the Dark Matter, phenomena, and is known as the Isotropic Rarefaction Pressure of Gravitation ( ), which describes the rarefying/condensing inhomogeneous and isotropic pressure, that is acting upon each and every one of the individual, infinite series of gradient spherical shell, energy potentials, of space, space-time, or gravitational field; where there is localized gravitational interaction, condensed matter, mass, and energy. The Isotropic Rarefaction Pressure of Gravitation ( ), and the Rarefaction Force of Gravitation ( ), is a measure of the pressure and density difference between the “Isotropic Aether towards Mass Gravitational Attraction” and twice the “Inertial Mass towards Mass Gravitational Attraction”; where there is localized gravitational interaction, condensed matter, mass, and energy. The Dark Matter, phenomena is postulated to be a result of this force, pressure and density difference, given by the Isotropic Rarefaction Pressure of Gravitation ( ), which is defined as the ratio of the Rarefaction Force of Gravitation ( ), divided by the gradient field, spherical surface area ( ) of each of the infinite series of concentric, gradient spherical shells, of energy potentials, of space, space-time, or gravitational field. The Schwarzschildfluid mechanical model, Perfect Fluid “Dynamic” Vacuum Energy Solution for the causality Dark Matter, phenomena of gravitation, is given by the “composite” Isotropic Rarefaction Pressure of Gravitation ( ), which is equal to the Isotropic Aether Gravitational Field Pressure ( ) subtracted from twice (2) the Inertial ( ) Mass Gravitational Field Pressure. 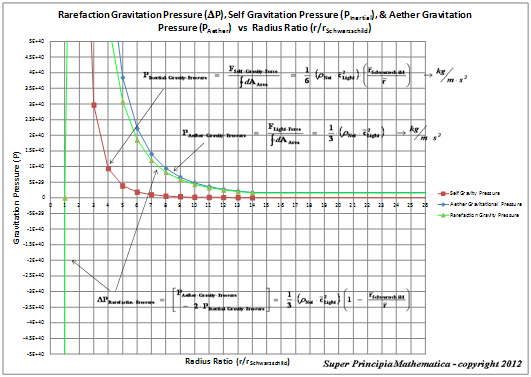 The Schwarzschildsolution, predicts the following equation for the Isotropic Rarefaction Pressure of Gravitation ( ). The Schwarzschild “Non-Euclidean” Metric ( ) describes a “dynamic” geometry and geodesic line element ( ), that describes the curvature of space, space-time, and the gravitational field; and must be used in conjunction, with a fluid mechanical model, Perfect Fluid “Dynamic” Vacuum Energy Solution for the causality gravitation, as described above. 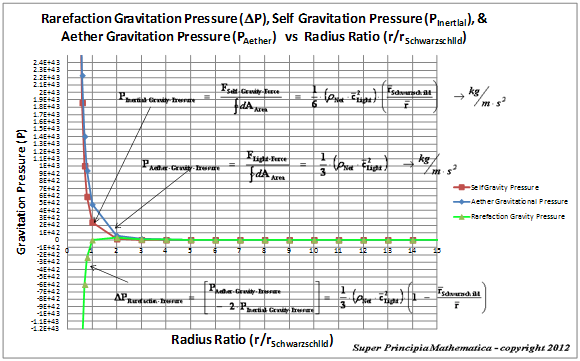 The Schwarzschildsolution, predicts that the following equation for the Isotropic Rarefaction Pressure of Gravitation ( ), is non-zero in the gradient of the gravitational field; except at the “Black Hole Event Horizon” ( ), and when the distance away from the center, of the localized gradient gravitational field, is infinite ( ); there the Isotropic Rarefaction Pressure of Gravitation ( ), is zero. The Isotropic Rarefaction Pressure of Gravitation ( ), is zero at the Black Hole surface, of a gravity vortex system body, and becomes approximately equal to the Isotropic Aether Gravitational ( ) Field Pressure at distances far away from the Black Hole Event Horizon, and into the infinity of space, relative to the center of the gravity vortex system body. The Einsteinsolution, predicts that the “constituent” Isotropic Aether Gravitational Field “Attraction” Pressure varies in direct proportional to one third the Inertial Volume Mass Density of the gradient gravity field. The Einsteinsolution, predicts the following equation for the Isotropic Aether Gravitational Field Pressure ( ); is non-zero; except at the infinite distance in the gradient gravitational field, away from the “Black Hole Event Horizon” ( ), there the Isotropic Aether Gravitational Field Pressure ( ) is equal to zero. The Newtonsolution, predicts that the “constituent” Inertial Mass Gravitational Field “Attraction” Pressure varies in direct proportional to one sixth the Inertial Volume Mass Density and multiplied by the distance ratio relative to the Black Hole Event Horizon ( ), of the gradient gravity field. The “Schwarzschild” Spherically Symmetric Metric ( ) corresponds to a gradient gravitational vortex system, where the, “Refraction/Condensing Pressure” ( ) is zero, on the exterior surface, of the Black Hole Event Horizon; ( ). Next substituting the Gradient Gravity Field Inertial Volume Mass Density ─ ( ), into the above equation; yields the following. Next substituting the Gradient Gravity Field – Black Hole Event Horizon – Semi-Major Radius ( ), into the above equation; yields the following. The “Einstein Metric” Spherically Symmetric gradient gravitational field vortex system body, describes a static “Refraction/Condensing ( ) Pressure”, which changes in direct proportion to one third, the Inertial Volume Mass Density ( ), of the gradient gravitational vortex system body. The Isotropic Rarefaction Pressure of Gravitation ( ) is a fluid mechanical, rarefying/condensing “Dark Matter Isotropic Pressure Force”, in an inhomogeneous gradient gravitational field, which reduces the pressure, forces, and densities, on individual spherical gradient gravitational energy potential surfaces; nearer to the surface of the Black Hole event horizon; and the rarefying densities and pressures, of the infinite series of surfaces, return to normal, located an infinite distance away from the black hole source of gravity. The Isotropic Rarefaction Pressure of Gravitation ( ) is responsible for the phenomena known as “Dark Matter” and is a rarefying pressure, decreasing and normalizing the gravitational densities, forces, and pressures, experienced by a test mass body ( ), in the gradient gravitational field of a Net Inertial Mass/Matter ( ) source, as it is moved “outward” through the gradient gravitation field, and is far away from the Black Hole Event Horizon, reaching into infinite distances of space. And likewise the Isotropic Rarefaction Pressure ( ) of Gravitation is responsible for the phenomena known as “Dark Matter” and is a condensing pressure, increasing the gravitational densities, forces, and pressures, experienced by a test mass body ( ), in the gradient gravitational field of a Net Inertial Mass ( ) source, as it is moved “inward” through the gradient gravitation field, from infinite distance, and towards the surface of the Black Hole Event Horizon, and center of the gravity field. The graphs below give a closer zoomed in view of the area surrounding the Black Hole Event Horizon. A space-time continuum is where matter, space, and time become inherently intertwined or inseparable; and the speed of light ( ) is constant, isotropic, and homogenous for all observers. The “Mass-Energy Equivalence” in Special Relativity (SR), refers to the “Inertial Mass” of a system body; and is the concept that the mass of a body is a measure of its energy content, ( ). And likewise, makes the claims that, whenever any type of energy ( ) is removed from a system, the mass ( ) associated with the energy ( ) is also removed, and the system therefore loses mass ( ). The “Mass-Energy Equivalence” in Special Relativity (SR), which describes an “Inertial Mass” ( ) system body, with the “Rest Energy” content, ( ), means that if a system body gives off the energy in the form of electromagnetic heat radiation mass-energy, it’s “Inertial Mass” ( ) also diminishes. The “Principle of Equivalence” in General Relativity (GR), which describes a “Gravitational Mass” ( ) system body, means that if a system body gives off the “gravitational field” energy in the form of electromagnetic heat radiation mass-energy, it’s “Gravitational Mass” ( ) and “gravitational field” also diminishes. Thus, the “Mass-Energy Equivalence” of Special Relativity (SR), combined with the “Equivalence Principle” of General Relativity (GR), makes the claims that the “gravitational” mass and the “inertial” mass are identical, or the same, for every object in nature. Therefore, the “Mass-Energy Equivalence” of Special Relativity (SR), combined with the “Equivalence Principle” of General Relativity (GR), results in the prediction that all forms of energy contribute to the gravitational field, created by an object with mass or energy. And a space-time continuum is where matter, space, and time become inherently intertwined or inseparable. In this concept, mass is a property of all energy, and energy is a property of all mass, and the two properties of “Mass” ( ) and “Energy” ( ), are connected, by the product of the “Gravitational Field Acceleration” ( ), and the geometric “Area” ( ) of space; equal to the square of the distance ( ), measured relative to the center of mass of the system. Furthermore, Mass-Energy Equivalence” of Special Relativity (SR), combined with the “Equivalence Principle” of General Relativity (GR), results in the prediction that the “gravitational field” energy, propagating in the form of “electromagnetic heat radiation” energy, is also a form of mass-energy. The proof of this is the observational fact, due to the gravitational attraction, of “electromagnetic heat radiation” in the form of “light” bending, as it passes by the sun. This bending of light, where there is large mass/matter and gravitational field energy, was observed; and confirmed that the energy carried by “light” is indeed, equivalent to a gravitational mass. There is also the observational fact that the frequency ( ) and the energy of photons increases when they fall in the gravitational field ( ) of the earth. The energy, and therefore the gravitational mass ( ), of photons are proportional to their frequency ( ) as given by the Einstein/Planck electromagnetic energy ( ) relation. The Net Inertial Linear Mass Density ( ), of a localized gravitational field source, is a measure of the “inhomogeneous gravitational field” linear mass density of the gradient gravitational field; and is defined as the Net Inertial Mass ( ), divided by the Semi-Major Radius ( ) distance relative to the center of the inhomogeneous gradient gravitational field, vortex system body. The Net Inertial Linear Mass Density ( ), is a measure of rarefaction or condensing in the linear mass density of the “inhomogeneous” gradient gravitational field, which is comprised of an infinite series of “spherical shell potentials” relative to the center of the gradient gravitational field, vortex system; and exterior to the Black Hole Event Horizon. The Net Inertial Linear Mass Density ( ), is a direct measure of the localized “linear mass density” of the gradient gravitational field, space-time continuum in a vacuum of space-time, relative to a Black Hole, Event Horizon, and the center of the gradient gravitational field system mass body. In this “Gradient Vortex Gravitational Field” model, the Net Inertial Linear Mass Density ( ) is a “maximum” linear density at the Black Hole Event Horizon” origin source, of the gravitational gradient field; and where ( ). Furthermore, the Net Inertial Linear Mass Density ( ) is “condensed” in close proximity to the Black Hole Event Horizon” gravity source; and is “rarefied” far away from the gravity source. The Net Inertial Linear Mass Density ( ) is a “minimum” linear density, of the gradient gravitational field, when the Semi-Major Radius ( ), is greater than the Black Hole Event Horizon Schwarzschild Radius ( ), of the gradient gravitational field. The most minimum spatial “Volume” ( ) and space distance, of the “Gravitational Vortex” “homogenous” gradient gravitational field is the Black Hole Event Horizon –Schwarzschild Radius ( ). At this most minimum volume and distance of the “Gravitational Vortex” gradient gravitational field, the Black Hole Event Horizon – Inertial Linear Mass Density ( ) is maximum, and is a universal constant. The “Black Hole”Net Inertial Linear Mass Density ( ), is a universal constant for every mass body, in the universe. 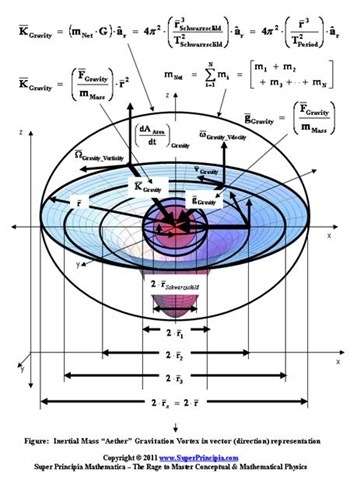 The Inertial Linear Mass Density ( ) is maximum and constant for every mass body in the universe, when the Semi-Major Radius distance, relative to the center of the vortex gradient gravity field, is equal to the Schwarzschild radius ( ) of the gradient gravitational field. Located at the Black Hole Event Horizon and source of the gravitational field, the space-time continuum in a vacuum, is where the matter, mass, and energy, denoted by the Net Inertial Mass ( ), is intertwined, and varies in direct proportion to the smallest “space or distance” which is condensed at the center of the gradient gravitational field, and is denoted by the Schwarzschild Radius ( ); there matter warps, and curves the space and time, in the local vicinity of the mass. The “Black Hole”Net Inertial Linear Mass Density ( ) universal constant, is a measure of the “maximum” linear mass density and “source” of the “Black Hole – homogeneous” gradient gravitational field, and is a direct measure space-time continuum in a vacuum at that location. A space-time continuum is where matter, space, and time become inherently intertwined or inseparable. The “Black Hole”Net Inertial Linear Mass Density ( ), is a constant of nature, defined as the ratio of the, Net Inertial Mass ( ) divided by the Schwarzschild Radius ( ), of the Black Hole Event Horizon, of the gradient gravitational vortex field. The “Black Hole”Net Inertial Linear Mass Density ( ) universal constant, is the “vacuum energy” binding proportionality between “Matter/Mass” and the “Space” of the “Vacuum of Space-time”; and can be modeled as a “fabric continuum” or “vacuum energy” that permeates throughout the entire universe. 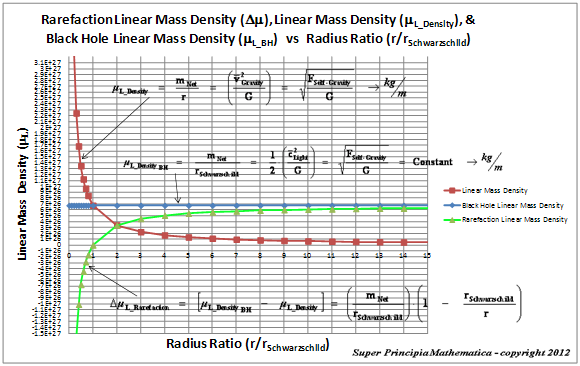 Now, that the constituent “linear mass densities”, the Net Inertial Linear Mass Density ( ), and the “Black Hole”Net Inertial Linear Mass Density ( ) have been described and discussed, the composite “linear mass density” ( ) can be expressed as a differential. In this “Inertial Mass Gravity Vortex” model we combine the concept of Newtonian gravitational attraction, where mass is attracted to mass, with the Isotropic Aether gravitational attraction, where aether is attracted to mass with the concept of Kepler’s Third Law, which describes the gradient gravitational field vortex, as an infinite series of spherical gradient gravitational potentials, which extend outward relative to the center of the vortex. The Kepler’s Third LawInertial Mass Evolutionary Attraction Rate – Magnitude ( ), is a measure of the evolutionary attraction of “mass towards mass”, and towards the center of the gravitational vortex system; and is a local constant whose value is directly proportional the Net Inertial ( ) Mass, of an isolated gradient gravitational field system. 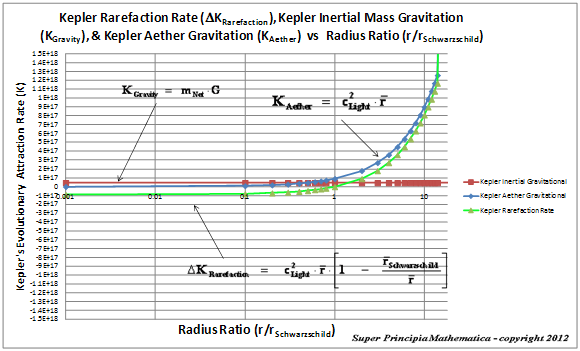 The Kepler’s Third LawIsotropic Aether Evolutionary Attraction Rate – Magnitude ( ), is a measure of the evolutionary attraction of “aether towards mass”, and towards the center of the gravitational vortex system; and is a variable whose value is directly proportional the Semi-Major Radius ( ) and distance, as measured relative to the center of an isolated gradient gravitational field system. The concept of Kepler’s Third Law also describes a composite “Rarefaction” Evolutionary Attraction Rate ( ), and is a differential and measure of change “inhomogeneous gravitational field” Evolutionary Attraction Rate of the gradient gravitational field, relative to the center of the gravitational field gradient, or the Black Hole Event Horizon, of a localized gradient gravitational field. The Kepler’s Third Law“Rarefaction” Evolutionary ( ) Attraction Rate, is a measure of the evolutionary attraction of “Dark Matter” phenomena; and is a variable whose value is directly proportional the difference between Isotropic Aether Evolutionary Attraction Rate – Magnitude ( ), and subtracted from twice (2) the Inertial Mass Evolutionary Attraction Rate – Magnitude ( ). The composite “linear mass density” is known as the “Rarefaction” Net Inertial Linear Mass Density ( ), and is a measure of the change “inhomogeneous gravitational field” linear mass density of the gradient gravitational field, relative to the center of the gravitational field gradient, or the Black Hole Event Horizon, of that gravity field. The Change in the Gravitational Potential Energy ( ), is directly proportional to changes in the “Rarefaction” Net Inertial Linear Mass Density ( ), and is a measure of the Keplerian gradient gravitational field ( ), which is comprised of an infinite series of “spherical shell “energy” potentials” relative to the center of the gradient gravitational field, vortex system. The “Rarefaction” Net Inertial Linear Mass Density ( ), is a differential and is a measure of the Keplerian gradient gravitational field, which is comprised of an infinite series of “spherical shell “linear mass density” potentials” relative to the center of the gradient gravitational field, vortex system; and is a direct measure space-time continuum in a vacuum. The “Rarefaction” Net Inertial Linear Mass Density ( ), is a differential measure of the Keplerian gradient gravitational field, and is directly proportional to the following differentials. In this section it will be discussed the constituent Gravitational Forces – Inertial Mass “Self” Gravitational Attraction Force ( ) and the Aether Gravitational Attraction Force ( ). In the Super Principia Unified Gravitation Theory, the Newtonian “Self” Force of Gravitation ( ) is responsible for the “attraction of mass towards mass” and towards a center of a gravity source system. The Aether “Light” Force of Gravitation ( ) is responsible for the “attraction of the gaseous aether towards mass” and towards a center of a gravity source system. The aether gas, is also described by the isotropy of space-time, given by the square of the “Speed of Light” ( ), of the vacuum of space-time. The constituent Gravitational Forces – Inertial Mass “Self” Gravitational Attraction Force ( ) and the Aether Gravitational Attraction Forces ( ), are also described as fluid dynamical forces shown below. In the Super Principia Unified Gravitation Theory, the Newtonian “Self” Force of Gravitation ( ) is described as a fluid responsible for the “attraction of mass towards mass” and towards a center of a gravity source system. The Aether “Light” Force of Gravitation ( ) is described as a fluid responsible for the “attraction of the gaseous aether towards mass” and towards a center of a gravity source system. In this section it will be discussed the composite Gravitational Force – Rarefaction Force of Gravitation ( ). 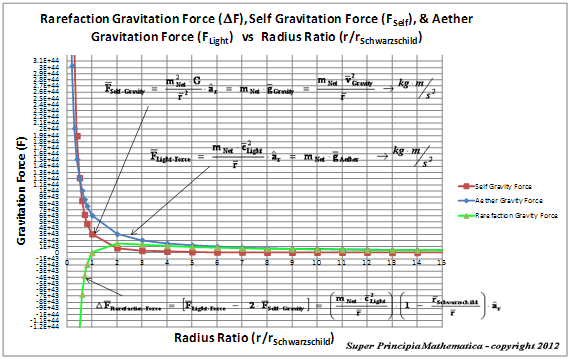 In the Super Principia Unified Gravitation Theory, the Rarefaction Force of Gravitation ( ) is a “Dark Matter “Isotropic Pressure” Force” equal to the difference between the Aether “Light” Force of Gravitation ( ), and twice (2) the Newtonian “Self” Force of Gravitation ( ); and is related to the “Time” ( ) component or term, described in the Schwarzschild Metric ( ). The Rarefaction Force of Gravitation ( ) is a rarefying force, normalizing the gravitational densities and pressures, experienced by a test mass body, in the gradient gravitational field of a Net Inertial ( ) Mass/Matter source, as it is moved “outward” through the gradient gravitation field, and is far away from the Black Hole Event Horizon, reaching into infinite distances of space. And likewise the Rarefaction Force of Gravitation ( ) is a condensing force, decreasing the gravitational densities and pressures, experienced by a test mass body, in the gradient gravitational field of a Net Inertial Mass ( ) source, as it is moved “inward” through the gradient gravitation field, from infinite distance, and towards the surface of the Black Hole Event Horizon, and center of the gravity field. The Rarefaction Force of Gravitation ( ), is further derived below and defined as the product of the Inertial Linear Mass ( ) Density, multiplied by the difference in the square of the Speed of Light ( ), subtracted from two times the square of Inertial Mass Gravitational Tangential Velocity ( ). The Rarefaction Force of Gravitation ( ), predicts that due to the presence of matter, and the curvature of space, space-time, and the gravitational field, the Inertial Linear Mass Density ( ) varies according to the proportionality below. The Rarefaction Pressure Force of Gravitation ( ), of a Spherically Symmetric gradient gravitational field vortex system body, describes a static “Refraction/Condensing ( ) Pressure”, which changes in direct proportion to one third, the reduced and rarefying Inertial Volume Mass Density ( ), of the gradient gravitational vortex system body. 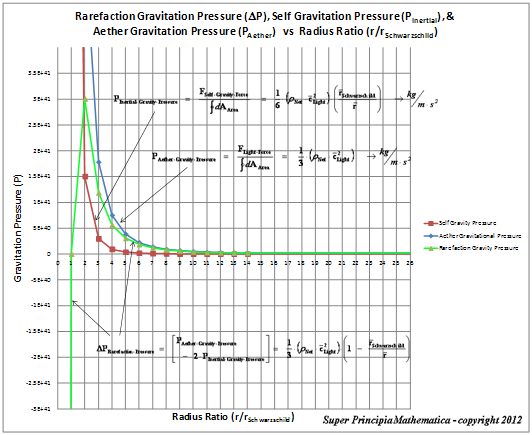 The Rarefaction Pressure Force of Gravitation ( ), predicts that due to the presence of matter, and the curvature of space, space-time, and the gravitational field, the Inertial Volume Mass Density varies according to the proportionality below: ( ). The Rarefaction Force of Gravitation ( ) is a fluid mechanical, rarefying/condensing “Dark Matter Isotropic Pressure Force”, in an inhomogeneous gradient gravitational field, which reduces the pressure, forces, and densities, on individual spherical gradient gravitational energy potential surfaces; nearer to the surface of the Black Hole event horizon; and the rarefying densities and pressures, of the infinite series of surfaces, return to normal, located an infinite distance away from the black hole source of gravity. The above Rarefaction Force of Gravitation ( ) fluid mechanical, rarefying/condensing “Dark Matter Isotropic Pressure Force”, equations are very interesting; and tell us a lot about how the curvature and the gradient gravitational field is created or formed. The Spherically Symmetric Space, Space-time, or Gravitational Field of the various gravitational forces, behaves like a “Perfect Fluid” around the Black Hole Event Horizon, of any Net Inertial Mass ( ) and Gradient Gravitational Field are described by the Spherically Symmetric Metric equation below. 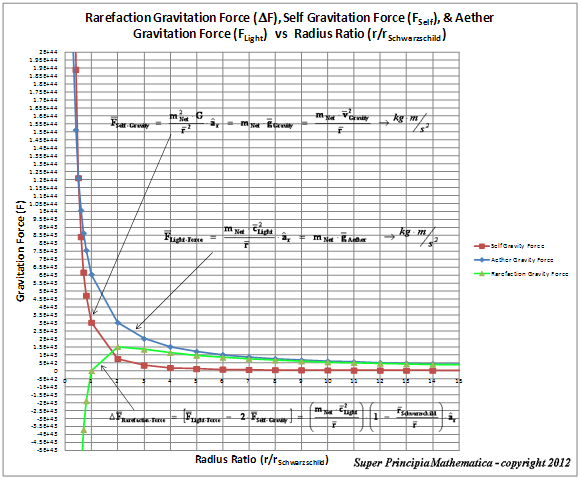 The graphs of the Rarefaction Force of Gravitation ( ) “Perfect Fluid” mechanical, rarefying/condensing “Dark Matter Isotropic Pressure Force”, are show below. The graphs below, demonstrate that there is a lot of gravitational interaction, around the Black Hole Event Horizon of any Net Inertial Mass ( ) and Gradient Gravitational Field. Within the surface of the Black Hole Event Horizon, and when the Semi-Major Distance is given by ( ), the magnitude of the Newtonian “Self” Force of Gravitation ( ) is larger than the magnitude of the Aether “Light” Force of Gravitation ( ). The Rarefaction “Dark Matter” Force of Gravitation ( ) is dominated by mass gravitation towards mass attraction in this case. Within the surface of the Black Hole Event Horizon, and when the Semi-Major Distance is given by ( ), the magnitude of the Newtonian “Self” Force of Gravitation ( ) is smaller than the magnitude of the Aether “Light” Force of Gravitation ( ). The Rarefaction “Dark Matter” Force of Gravitation ( ) is dominated by aether gravitation towards mass attraction in this case. Within the surface of the Black Hole Event Horizon, and when the Semi-Major Distance is given by ( ), the magnitude of the Newtonian “Self” Force of Gravitation ( ) is equal to the magnitude of the Aether “Light” Force of Gravitation ( ). The Rarefaction “Dark Matter” Force of Gravitation ( ) is in equilibrium with aether gravitation towards mass attraction and mass gravitation towards mass attraction in this case. Rarefaction “Dark Matter” Force of Gravitation ( ) is always becoming more, and more, like the Aether “Light” Force of Gravitation ( ), as the Semi-Major Distance ( ) is increased with great distance, far away from the Black Hole Event Horizon, and as the distance approaches infinity. This means that the “isotropic aether” is attracted to “mass/matter” from long ranges, even as the inertial mass gravitation, mechanism, where “mass/matter” is attracted to “mass/matter” from long ranges is diminished. The graph below give a closer zoomed in view of the area surrounding the Black Hole Event Horizon. The Schwarzschild and the Einstein “Non-Euclidean” Metrics ( ) describes the causality and geometry of the curvature of space, space-time, and the gravitational field, and is used in conjunction, with a fluid mechanical model, Perfect Fluid “Static or Dynamic” Vacuum Energy Solution for the causality gravitation. The proposed model in this work is the Unified Gravitation Vortex Theory. This Unified Gravitation Vortex Theory describes a closed solution for cosmological and quantum mechanical effects, of matter in motion throughout the universe. A fluid mechanical, perfect fluid vacuum energy solution to gravitation, makes that claims that the “Single Newtonian Gravity Force – Only” solution to gravitation is abandoned; in favor of a gravitation theory, that describes multiple or various “forces”, “densities” “pressures” and “energies” into a more unified theory of gravitation. This paper gave a conceptual and mathematical description for the reason for choosing to “Vacuum Energy Perfect Fluid” model, and using the Schwarzschild Metric over the Einstein Metric, based on the concept of whether there is “Zero Pressure” impressed upon the surface of the Black Hole Event Horizon. And likewise, whether the “Volume Mass Density” and the curvature of space, space-time, or the gravitational field, surrounding a matter source is normal throughout the gradient of a gravitational field, or whether it is rarefied or condensed through the gradient of a gravitational field, and eventually becomes normal far away from the matter source. Minkowski, Hermann (1907/8), “Die Grundgleichungen für die elektromagnetischen Vorgänge in bewegten Körpern“, Nachrichten von der Gesellschaft der Wissenschaften zu Göttingen, Mathematisch-Physikalische Klasse: 53–111 *** Wikisource translation: The Fundamental Equations for Electromagnetic Processes in Moving Bodies. This entry was posted in The General Theory of Relativity and tagged Aether, Aether Force, Aether Gravitation, Black Hole, Black Hole Event Horizon, Cosmology, Dark Energy Gravitation, Dark Matter, Dark Matter Force, Dark Matter Pressure, Einstein Field Equation, Einstein Metric, Euclidean Geometry, Fluid Model Gravity, General Relativity, Gravitational Field, Gravitational Force, Gravitational Pressure, Gravitational Vortex, Heat Radiation Gravitation, Isotropic Force, Kepler's Third Law, Minkowski Metric, Non-Euclidean Geometry, Perfect Fluid, perfect fluid model gravity, Schwarzschild Metric, Self Gravity Force, Singularity, Special Relativity, Spherically Symmetric Metric. Bookmark the permalink.